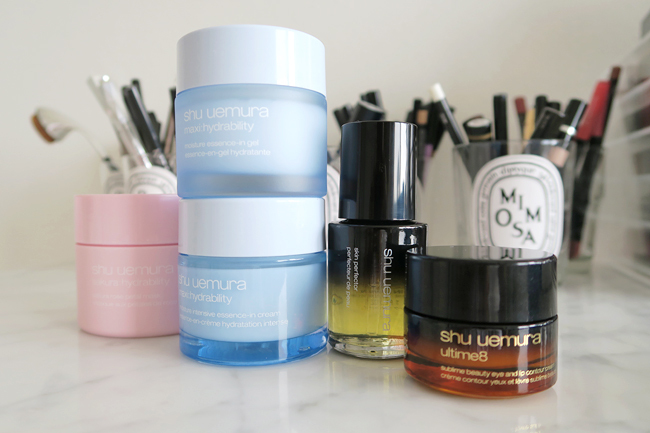 Shu Uemura is best known for their lovely lipstick selection and cult classic eyebrow pencils, but you may not have tried their skin care. A year ago I was recommending the Depsea line to those who needed basic hydrating products, but it was discontinued and reformulated. I wanted to share my updated list of favorites because there's a sale which makes it the perfect time to stock up or purchase Mother's Day gifts! 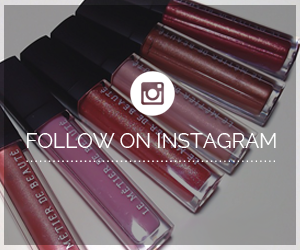 Use promo code RAEVIEWFF for 20% off $50+ orders and 25% off $125+ orders plus free shipping. 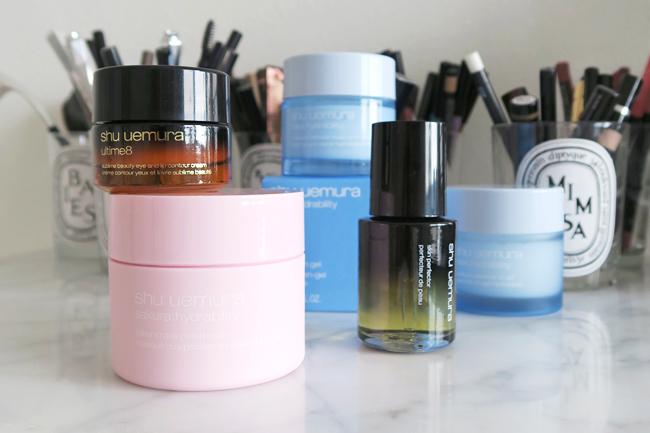 Valid from May 7 to May 16 on shuuemura-usa.com and shuuemura.ca. The new Maxi:Hydrability moisturizers are ideal for minimalists or to throw into a gym bag since both are 3-in-1 formulas! You get lotion, essence, and hydration in one pot. 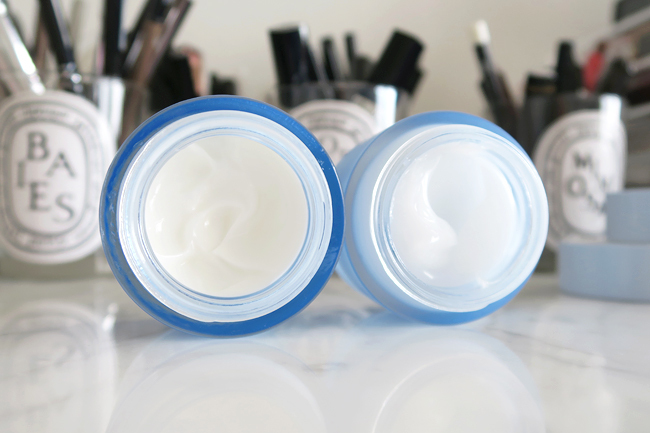 I use the Essence-in-Cream since I have very dry skin and it gives me balanced dewy skin with just a pea sized amount. No greasy residue whatsoever! This is one of the best moisturizers for this price range, especially considering it cuts down on prep time before my morning gym sessions. Those with normal to oily skin should try the Essence-in-Gel which is actually an excellent priming moisturizer since it fills in pores a bit better. There is more silicone in this formula, but I think it really does help to smooth the skin and prevent oil break through in the T-zone. The shiny glass vs frosted glass packaging is a nice touch for those who require or want both. Also new is the Sakura:Hydrability Rose Petal Mask and it's absolutely worthy of the online hype. I've tried a couple other cult classic rose infused hydrating masks, but most of them only relieve surface dryness. Not only did the Sakura:Hydrability mask make my skin baby soft and smooth to the touch, my face felt comfortably hydrated throughout the day. The gel formula isn't too sticky and quite subtly fragranced so this is truly suitable for all skin types. I leave it on for ten minutes and use it two or three times a week! 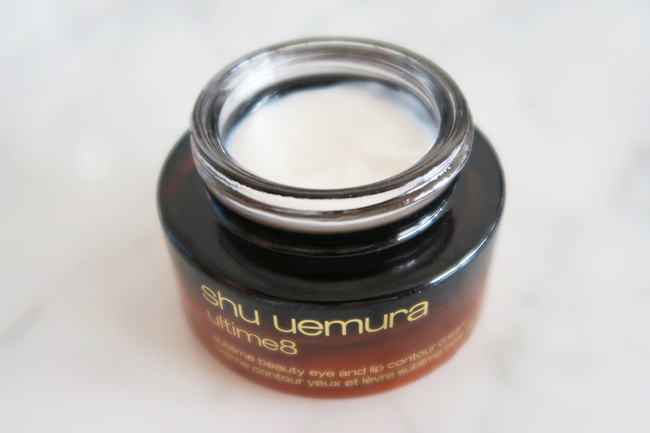 If you are in the market for a new eye cream, do try the latest Ultime8 launch. 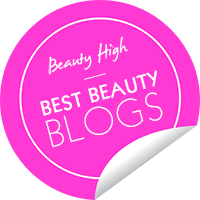 It's one of the most memorable eye creams I have tried at any price range! I do wish it came in pump packaging but the signature ombre glass is very elegant. The formula feels extra silky and softens the skin without making my eye makeup slip or crease, not too much silicone. It's not so rich that it causes milia or weighs down my eyelids. I normally use an eye gel but lately I have noticed my crow's feet were starting to extend so I use this Ultime8 Sublime eye and lip cream in the mornings and I can visibly see that it helps. Lastly, the Skin Perfector is an oil that is shaking up my routine. 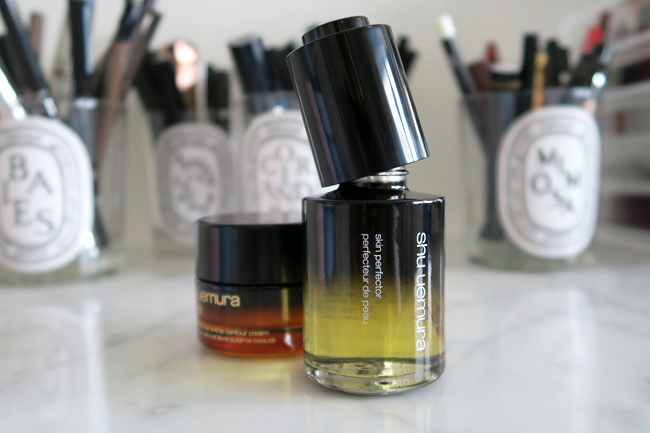 Shu Uemura recommends using 3 drops in the morning and 5 drops at night after your normal skin care, but I do not use it as skin care. I prefer to treat it as an oil primer to prep for base makeup. Additionally, you can add a drop to your liquid foundation or tinted moisturizer to help it blend out more easily. I am obsessed with oils and have tried so many, but this Skin Perfector has the sleekest dropper I've ever seen and absorbs faster than most! Even if you have oily skin, you shouldn't be afraid to try this one.